The chances to win your purchase for free in the prize draw. Tablet usability rating: 4/5. No mobile page for Tablet. No open questions, need to enter personal information. Smartphone usability rating: 3/5. No mobile page for smartphones. 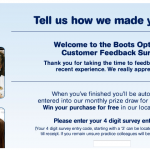 You can still finish Boots Opticians customer feedback survey via smartphone, it may take longer time. Indicate your answers to questions or statements regarding your visit, like "I got the help and support i needed to make my choice" ,etc. 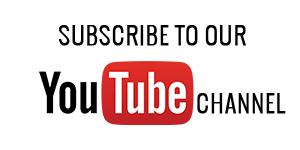 If you have difficulty in finishing Boots Opticians survey online, you can turn to the video below made for help. I would like to commend Luke at the Forestside Branch of Boots Opticians in Belfast for his special care and attention. I was away from home and needed help which necessitated arranging things with my local branch. He was patient and professional and never made me feel I was asking too much. I was helped and supported by his efficiency at a difficult time and would like his excellent care to be noted and rewarded. I went to the Farnborough branch of Boots opticians and was seen by Rebecca. She was very helpful when choosing my new glasses and also when I collected them. She explained all my options clearly. Thank you Rebecca. I had a problem with my new glasses and so returned to the store (code 3003) and was served by Sam Khan. What a great service he provided with excellent customer relation skills - always polite, he answered all of my questions succinctly. Saw Henry and Simon today both brilliant professional and completely helpful. All was fine until I looked at Patient details in the folder given 2 me , my details are incorrect; should be ; 24 CHAPEL CLOSE. Thank you Boots, I can see again new glasses are amazing, After losing my old glasses two weeks ago my world has been a blur. NOT ANY MORE !! The sales person Lewis was also very helpful, MONEY WELL SPENT !! Went into Boots Greenock to browse and was approached by Lee. She offered to clean my glasses and while chatting I agreed to an eye test as I was long overdue but kept putting it off. I was given my eye test by Mark who identified that I no longer required glasses for walking about but that my reading glasses needed to be a bit stronger. So glad I went in as the service was impressive and the range of frames very good. It did not take me Long to find the pair I liked. I went back in June 4th to order a second pair and once again the service from Vivienne was great. Boots is now my chosen opticians. Great service, range and prices, I put it usually costs me but happy now. I went for my 2 year eye check at Boots, Fosse Park and was greeted by Ellen who took me through for the basic tests. She immediately put me at ease and was very informative on the results. I was immediately passed to Hamel who was kind and courteous, and after the thorough eye checks he gave me the diagnosis on the state of my eyesight and advised the best treatment. I then went back to Ellen who helped me choose the correct frame for the new lenses. She also advised what additional items I didn't realise were free and which would help me. I am now waiting to collect my new glasses. I would like to thank Ellen and Hamel for their outstanding attention from someone with a bit of "white coat syndrome"!! I have meant to post this thank you for months. Last year I suffered a detached retina, but only realised this following an examination by Rasheidaa at Drake's Circus Plymouth. It was extremely traumatic, made more complicated by a concurrent house move. Although the booking system failed, time was made to see me despite being late in the day. My examination was thorough and very professionally undertaken. The diagnosis was complimented by the ophthalmic surgeon at REI Plymouth on its accuracy. As an emergency case Rasheidaa helped me to make contact with the hospital and followed up with several calls to make sure the eye was receiving urgent attention. This support was very welcome and given with genuine warmth. I am pleased to say the operation was successful and I will back to Boots once I have had the follow up cataract operation. A very big thank you to all the team at Drake Circus. The service I get from both the optician ( Fatima) and the friendly staff is second to none. They will do anything they can to support you and the service is first class. The whole family come here and wold never go anywhere else. The staff are very helpful at Boots. I bought two pairs of glasses last year and while the service was good I really didn't get on with the fact that they were tinted so I returned recently and quickly got a third pair (untinted) and I am very pleased with these. This time I saw Adam. Jo and Tom. I had excellent care from Clare at Boots opticians in Hamilton code 3719 a few weeks ago when I turned up without an appointment. She very quickly diagnosed my problem and carefully explained how I should care for my eyes. As this was my first ever visit I felt confident in returning for my annual eye test. I was seen by Colin and Laura at this visit who continued the friendly professional service. Well done Hamilton store. Keep up the good work. who helped me sort out my glasses and choose new ones was excellent his name is ken at the Altrincham store. He advised me toeye check right away been having problems while on holiday.Thanks to him the optician saw me that same afternoon and told me if it happened again I must go to the eye hospital. so his advise was very good and the service excellent. I will return to boots Altrincham next year for my eye test. Thank you to Mr Colin Connor and Lana, for their very professional and friendly attitude during my appointment at Boots, Forestside on Tuesday. Very helpful staff.I was seen by Daxsha in Dartford who was patient and explained how to use my glasses so that I would get used to them quickly. I am very happy with the eye test I had today, several different tests were made to check my eyes are healthy which left me very assured. Staff very helpful. I had an examination recently the optician was Hannah Robertson, Dispensing Optician Geraldine Barnes and the optical Consultant was Sophie. I cannot fault any of their professional care and I shall of course return to the Skipton Branch when I require another eye test. I was attended by Seema at the Loughborough branch, the service was excellent. Always find a friendly face, extensive examination, and am pleased with the end product. Thank you. Attended Sunderland branch for an eye test on Tuesday 20th Oct. 2015 and was greeted by very friendly, courteous staff. I was guided through the process by Marie (3269 ), who dealt with the purchase of my glasses. The optician explained checks being performed and made me feel at ease. At no point did I feel pressured into buying something I didn't want, therefore feeling comfortable to go ahead. I would recommend this branch due to the quality of service. I went for an eye test in June at Boots in Sevenoaks code 3746 and Daria was so helpful, polite and cheerful and did the test before handing me over to the optician. Daria was available when I collected my glass and recognised me and really good. i went back for a second pair and Zoe helped with the odering and when I returned to collect them Daria was there and once again recognised me and made me feel most welcome. If all your staff are as helpful, willing and knowledgeable then your Branch in Sevenoaks will certainly be the head of your chain of opticians. Daria in particular is a credit to your practice. The whole experience from being greeted by Donna, being handed over to the very capable Ruth for the actual test, then onto Georgie who's help in selecting suitable new glasses was a terrific help. You can rest easy with the knowledge that all your staff at the Camborne Branch of Boots is a credit to the company. WE attended Ankerside Boots, Tamworth.We found the staff helpful and kind and pleased with the professional attention we received. My wife found the range of glasses more than adequate and prices very reasonable. We shall continue to use Boots. I called in on the off chance after walking out of Specsavers where although I had an eye test that took nigh on an hour to complete I got my prescription and left disgruntled. On reaching Boots a simple enquiry made to Rebecca at reception she ascertained all dispensers were free so within a few mins I was sat with Colin ( dispenser ) his professionalism and attention to detail and the way he explained things to Rebecca ( who is still a trainee, also she had asked my permission to sit in with us ), both of them thorough professionals a credit to Boots and the companies training programme, also a big bonus their prices with the current deals far cheaper than specsavers for excellent looking frames. The staff at Boots optician Windsor Court Morley were very helpful. The optician Aneala was very efficient and reassuring. She answered my questions and told me exactly what she was doing throughout the test. Kayleigh the lady who took me through choosing my new glasses was patient and helpful and discussed all my options pricewise with me. She did not rush me at all although the shop was quite busy. I felt valued as a customer by everyone I dealt with. Thank you. I pick up my new glasses next week and I hope the service will be as good. I'm sure it will. Amber was confident and profesional in her treatment with me. Faryal, from market street practice in manchester,she was super brilliant and helpful,she take her time to explain to me how to wear my contact lens,if not for her patient and her assurance i dont think i can do it. Sabiha and Richard at Sedley Place London were very patient, friendly and helpful in explaining the procedure and the benefits of paying a bit extra to obtain good value for money on the glasses required. Richard has the most pleasant personal relationships and good humour. I enjoyed myself at the store despite the heavy downpour outside on that day.